Ok ... a new day and hopefully I will get a lot done. My parents are coming for the weekend and I need to get a lot done before they arrive!!! I have some monogramming orders to finish and some projects I would love to start so my very handy Dad can help out while he is here. He loves a project and I LOVE the help! My cute friend hikinco at Queeda Mae, http://www.hikinco.blogspot.com/, asked for Valentine Party details. Well, I am sad to say I will not be hosting one this year. Very, very sad! It was either give up the idea or start smoking crack. I am not a fan of drugs so the party had to go. Since Lawyer is gone and all the kids are sick something had to be scrapped or my sanity would be the one to go!! We have decided to meet for lunch on Thursday instead. It will not be the same for me but I think it could be great fun. I am, however, having a fun dinner for the kids on Thursday night which I will give to you in DETAIL. I love Valentines Day and love to go all out!!! I will give you some details from last year ... when I had my friends and their little ones over for lunch. The photos above are the table setting and the centerpiece in the dining room. I hope you like them ... I love all things vintage. 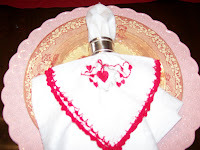 The napkins were set with vintage hankies and the bowl in the centerpiece photo is filled with antique red and pink Christmas ornaments. 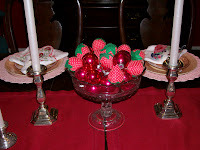 I topped it off with cute little stuffed strawberries I found at the antique show. I will post about the menu tonight! The salad was super yummy! Thank you for putting me in your post! How sweet of you! I read your above blog too, about being home alone. I HEAR YOU GIRL! I know--I totally understand where you are coming from. Hang in there and you have a right to feel the way you feel--it is HARD being home alone w/little ones! I have to do it too! Eat some more chocolate and have one more cup of coffee. That might help!